One of my favourite places to visit is the spa to get a facial. I haven’t been in so long and it is something I miss doing. It’s something nice I do for myself because I always look and feel better afterwards. Now that I am in my early 30’s, I do worry more about wrinkles. I have very oily skin so I don’t really have any yet, but my goal is to keep them away as long as possible! I know that wrinkles are a part of life and I can accept that. Personally, I would never get plastic surgery, but I am interested in trying other methods to keep my youthful appearance. deeply hydrating without clogging pores for fresher, more luminous skin. I found the applicator really easy to apply. It had an area for my nose, openings for my eyes and mouth and I sure was a sight! I scared John when I came into the bedroom after applying it. I was able to slip on my glasses over the mask and work on the computer while the applicator worked its magic. I could feel a little tingling feeling at first, but it was comfortable to wear. After the 45 minutes was up, I peeled off the mask and washed the remaining cream off my face. I noticed that my skin felt incredibly soft and smooth and had a nice glow to it. I felt refreshed and rejuvenated. I wasn’t red or irritated at all. Sometimes my skin gets a little red after a facial, but with this product, my skin tone was very even. I would have liked to be able to get the box which contains the 4 applicators and try it over a couple weeks and see what kind of difference it would make. 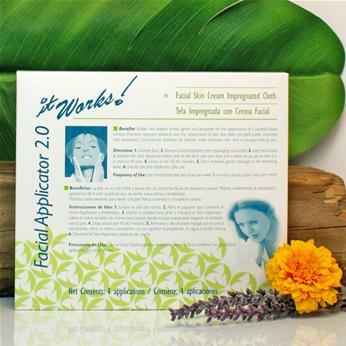 The Facial Applicators retail for $89. The Loyal Customer price is $49. I’m curious to see what kind of results my mom would have with one of these applicators. I bet she would really like it because I know I did! 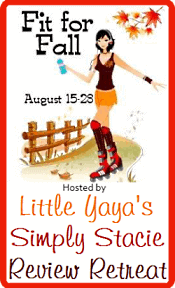 Entered Little Yaya’s It Works! Giveaway. I would like the try the Defining Gel. Follow Simply Stacie on FB. I’d like to try the stetch mark and anti aging cream. The website belongs to my son and daughter-in-law (Andy and Ashley Byers) if you need a distributor contact them. The website belong to my son and daughter in law (Andy and Ashley Byers) and they are distributor of IT WORKS. I know it’s been since 2010 (from what I can see) so if you haven’t found a distributor feel free to contact them.